Welcome to Make It Monday with Kraft Outlet. Use this week's "Birds" theme to inspire you to create your project and then link it up at the bottom of this post before 6:00 p.m. (Central Time) on Sunday March 8, 2014. Remember your projects MUST include the use of Kraft cardstock and/or items that can be purchased at Kraft Outlet! Also, all of our followers who participant in our challenges this month have a chance to be featured on our "Feature Me Fridays" posts as well as be entered to win a $15.00 Kraft Outlet Store Voucher! Please limit your weekly challenge entries to your TWO best creations and thank you for your participation! When Design Team Member, Karen Letchworth, saw this week's "Birds" Challenge theme, she knew right away what she wanted to create. Her card all started with a Small Buff/Ivory Notecard which is an all-time favorite "must-have" item for her. 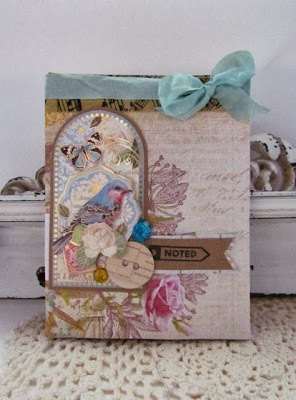 To that, she attached some patterned papers and a sweet little Journaling Card, and machine stitched them together. Next, she grabbed several Kraft Outlet goodies to embellish her card; including some of the yummy new Hand-Stained Vintage Winter White Seam Binding with a General Store Flatback in the center of the bow, a few lengths of Blue Baker's Twine and bright yellow Pastel Hemp Cord. She used two Black Apothecary Stickers (ruler trim and directions tag (under date circle), and a Jenni Bowlin Office Chipboard Button. Karen turned again to a Kraft Outlet favorite, her Bone Folder Tool, to apply the rub-on sentiment. There are so many awesome supplies at the Kraft Outlet to help you create something special. Karen hopes you'll treat yourself to something new, and looks forward to seeing your sweet creations shared in this week's challenge. For more photos of this card as well as a detailed supply list, you're warmly welcomed to stop by Karen's Blog, My Cup Runneth Over to take a peek. Kristi has Spring fever this week! Her spring colored card features a Spring wreath with some birds hoping to make a nest. 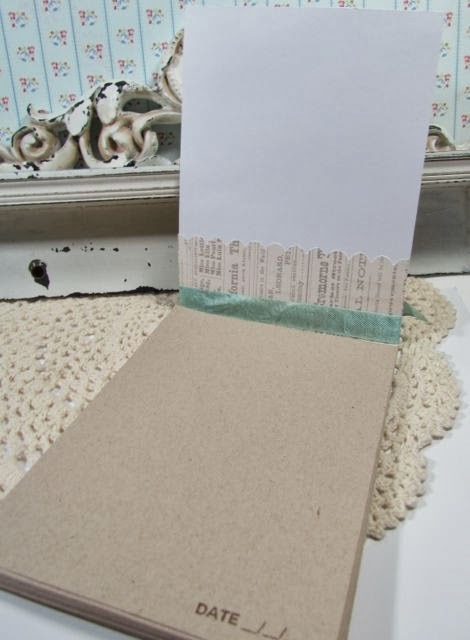 She began by using some Brown Lunch Bag Kraft card Stock as the card base. After layering pink and blue card stock to the front, she layered some pretty pink floral paper on top, then used some Pink And White Washi Tape across the middle to hide where the two colored card stocks meet. She attached a Small Glassine Bag to the center.Her focal piece was made by layering a green die cut doily and her die cut stamped wreath. She used some blue cording from the Pastel Hemp Cord pack to fashion a bow and affix it to the center of the wreath. A pink glittery jewel was used as the finishing touch. Kristi's card also has a surprise: the sentiment is stamped onto a Blackboard Tag accented with some Hand Stained Bias Tape in Strawberry Shortcake. To see the tag and a complete supply list for this card, please hop over to Kristi's blog at Kristi's Paper Creations. For this week's "birds" challenge, Tammy started with a base of Brown Kraft Cover Weight cardstock next adding two different patterned papers to the card base. She added a snippet of a doily to the right side of the card next wrapping a length of Mint Green Tea Seam Binding around the card front and tied in a pretty bow embellishing with a button laced with Natural Hemp Cord. At the upper left corner, Tammy used a portion of a Journaling Ticket along with some mini clips and a button. Lastly she added her bird die-cut image and the sentiment to the lower left corner. For additional pictures and a complete supply list, please visit Tammy at Creating Somewhere Under The Sun. Anitra created something a little different this week. She chose to make a note pad using "Padding Compound". She started out with a "Precut Chipboard Small" as her base then cut "Light Kraft Text Weight Paper" to size of the chipboard. Next using the Padding Compound she adhered the base along with the text paper at the top creating a tear away paper pad. For her cover she used some patterned paper and adhered a tag with a bird image matted with "Brown Kraft Cover Weight Cardstock". Along the top she used "Music Washi Tape" and some beautiful "Hand Stained Bias Tape in Aqua Mist. Some gems and a "Chipboard Button-Office" are tucked in behind the bird image. A small banner was created using some Brown Kraft Cover Weight Cardstock which peeks out from the tag. For more information on how she created this note pad please stop by her blog: Stamping While They Sleep. Great cards by the DT! Always inspiring! You ladies rocked it with the gorgeous bird images! Each one so very pretty!